Upon arrival our representatives will meet and transfer you to your hotel. Balance of day at leisure to explore the city, visit the museums or take some of our optional tours and activities from Quito. Breakfast. This morning your comprehensive city tour includes visits to residential neighborhoods at the northern end of the city, visiting the Guapulo Mirador, passing through the 12 of October Avenue up to the Culture House and the Legislative Palace (Congress) where the rock murals that are related to the history of Ecuador can be appreciated. The tour will then continue through the Gran Colombia Avenue up to the Basilica Church, where you will make a brief stop and next, the San Juan Mirador from where you will have a beautiful sight of The Colonial Quito. After walking through the colonial streets you will then stop at the Independence Plaza admiring the Cathedral, the Governments Palace, and the Archiepiscopal palace. Furthermore, you will visit The Company Church where adornments and gold altars can be appreciated, a visit to the Sagrario Church and San Francisco Church, which was built during the 17th century. And then, you will be heading to the Panecillo Mirador, the most famous hill of Quito, from where a sight of the colonial and modern Quito will be taken. You will then be heading up to the Middle of the World City where the monument that divides the Northern Hemisphere from the Southern one will be visited. It was built during the XVII century when a French Expedition defined the precise location of the equatorial line. The Ethnographic Museum can be also be visited. Breakfast , day at Leisure to enjoy the city. Breakfast. Departure from Quito through The Pan-American North Highway with a brief stop at Calderon, a town where the famous masapan dolls are made. If timing allows, you will stop at the highways mirador to admire and take pictures of the beautiful landscape and snow capped mountains of the zone. Crossing the equatorial line at Guachala (used to be the middle of the world monument) you will head up to Otavalo and make a stop at Mira Lago to take pictures of the beautiful San Pablo Lake. The tour then continues to Otavalo where the Otavalenos (natives) set up a market in which a bartering manner of shopping is taken. The market hosts a variety of different handcrafted items. Continuing the trip, you will go to Cotacachi, famous for its leather articles, and where lunch will be taken. Finally you will go to Peguche, small village known for its waterfalls and wind instruments fabrics. 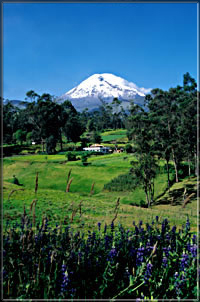 Return to Quito through the Cajas-Tabacundo road. Lunch is included. Upon arrival Welcome at the Baltra airport, you will be transferred by bus to the tip of the Itabaca canal, where you will proceed by a public ferry service in the Island of Santa Cruz. Our Representative will be waiting for you to transfer you to your Hotel located at Puerto Ayora. On the way, you will have the opportunity to visit the lava tunnels and a Turtle reserve. Visit to the Scientific Charles Darwin Station, where you can learn more about the Galápagos Islands; the species that live in this enchanted place, its origin, the theory of Evolution, the conservation programs, and observe some Giant Turtles in captivity. Overnight at Puerto Ayora. Breakfast at hotel. In the morning excursion to Tortuga Bay Beach, after 35minute walk (approx.) we will arrive to this magic place, one of the most beautiful beaches in the Galapagos!, with white sand and green mangroves. “Playa mansa” is where we can swim and enjoy of the beach. Free time to eat (lunch is not included). In the afternoon, aboard the yacht for a tour around the bay, starting with a visit to “La Lobería”, named because the vast sea lion colony that live there. Here you will be able to swim or snorkel, play with sea lions, see a variety of fishes and sea turtles. Then we proceed with our tour to the “Canal del Amor”, a marvelous site where nature gives us an unforgettable view; at the end of this channel, just a few meters forward, and a viewpoint where we can observe reef sharks; from here we continue with a short walk to see the marine iguanas that inhabit in “Playa de los Perros”. Punta Estrada will also be visited. Return to Puerto Ayora. This tour only takes place Mondays, Wednesdays, Fridays, and Sundays. Breakfast. Today you will enjoy of a Day Island tour in a yacht to one of the following Islands: Plazas, Seymour, Bartolomé, Floreana o similar ones. Lunch is included. In the evening return to Puerto Ayora, transfer to your hotel. Breakfast. Our representative will pick you up at your hotel and transfer you to the airport to take your flight back to Quito , where you will connect to your international Flight.